Artificial skin: Stanford University researchers use smart materials, sensors to mimic touch for prosthetics. 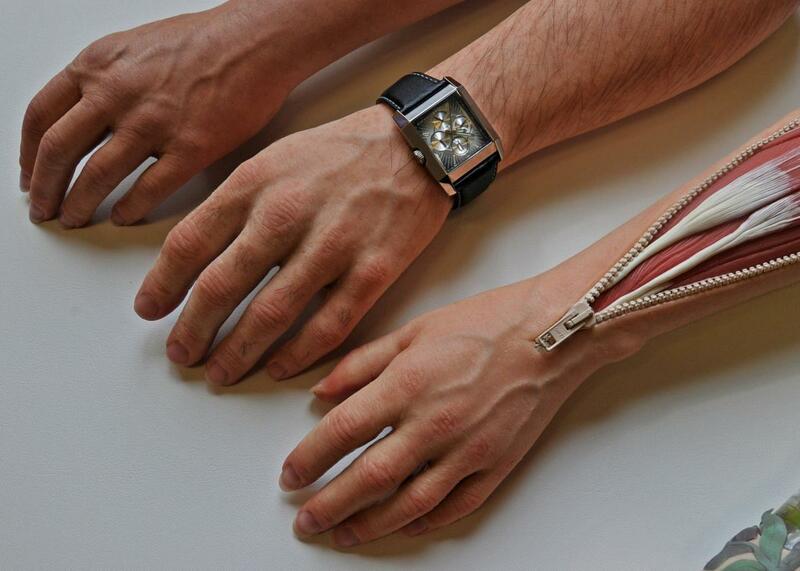 Fake “skin” could lend prosthetics a realistic sense of touch. Above, custom arm prostheses made by the Stamos+Braun Prothesenwerk GmbH company in Germany. When you lose an arm or a leg, you lose more than just the physical limb: You lose your sense of touch. That’s a problem. Without touch, it doesn’t matter how cool or smart your prosthetic is—you could have an Iron Man or Frozen arm, and it’s still going to feel like a ghost of your former limb. Yet touch is a complex thing to imitate. It relies on millions of tiny touch receptors embedded in your skin, which pick up every tickle, scratch, and pinprick, and then convey them to your brain through neural wiring. Now, researchers are finally making headway in building something akin to this multifaceted sense: A team at Stanford University has created an artificial “skin” so lifelike that it can stretch, bend, and translate nervelike signals directly to the brain. The researchers, led by chemical engineer Zhenan Bao, published their research last week in the journal Science. Today’s prosthetic limbs are already more than smart—they’re brilliant. This year, for the first time, paralysis patients demonstrated their ability to move their prosthetic limbs using just their thoughts, as part of a DARPA research project. Those two patients were fitted with a brain-computer interface that directly conveyed their brains’ commands to the machines they were manipulating, as Lily Hay Newman wrote about in Slate. They were able to shake hands, fist-bump, and “feel” where their prosthetics were in space—even from the other side of the room. But as jaw-droppingly cool as it is to be able to control a prosthetic using just your mind, futuristic limbs need to be able to do more. Without the sense of touch, you wouldn’t be able to pluck a grape from its stem without puncturing it or hug your partner without squishing him or her. Bao’s team has found a way to approximate this sense by bypassing the nerves altogether, using smart materials and delicate sensors. Her “skin” conveys electrical impulses directly to the parts of the brain responsible for touch and sensation, and could potentially be used on mind-controlled prosthetics like the ones being tested by DARPA. This isn’t the first foray into bringing back feeling to those who have lost it. Past researchers have used existing nerves in severed limbs to convey touch to other parts of the body, essentially by using the body’s own biological machinery in new ways. For example, researchers at Case Western Reserve University in Ohio have had success attaching the ends of cut-off nerve bundles in the arms to electronic sensors on patients’ prosthetics. Those patients reported feeling sensations from sandpaper to cotton to water trickling over the back of their hands. Bao’s work, by contrast, seeks to build the sense of touch from scratch. Compared with the human hand, of course, the experience is a tad crude. Bao estimates that she could place up to 10,000 sensors on one prosthetic hand; by comparison, each human hand is equipped with millions of touch receptors. Yet by human tech standards, the improvement is exponential. Bao’s sensors are tiny in comparison with the bulky ones researchers are currently using. Moreover, they’re delicate enough to sense and convey a range of pressure, from “a gentle touch to a firm handshake,” as Bao puts it. In the future, this kind of material could be used to make brain-controlled limbs more agile and, well, enjoyable. The applications here are broader than they might first appear. Replicating a sense of touch, Bao says, “would be a grand challenge. If we can do that, it could push the development of technology that could benefit other fields as well.” For instance, a thin, flexible “skin” could be used to enhance today’s wearable electronics; better sensors and more intimate contact with skin could monitor vital signs with increased accuracy. These kinds of sensors could also be used to enhance robotic surgery. Currently, when surgeons remotely control robots to perform delicate surgeries, they don’t feel a thing. Equipping the robotic parts that are inside the patient with artificial skin could give surgeons key feedback to improve their surgical techniques. It’s enough to make you feel all touchy-feely inside.